A while ago I needed to add another book from my Amazon wish list to qualify for free shipping. More or less randomly, I picked Ken Forkish's: "Flour, Water, Salt, Yeast" - the price was right! When I started leafing through the book, I was intrigued by his approach to kneading - or, better, not kneading the dough. 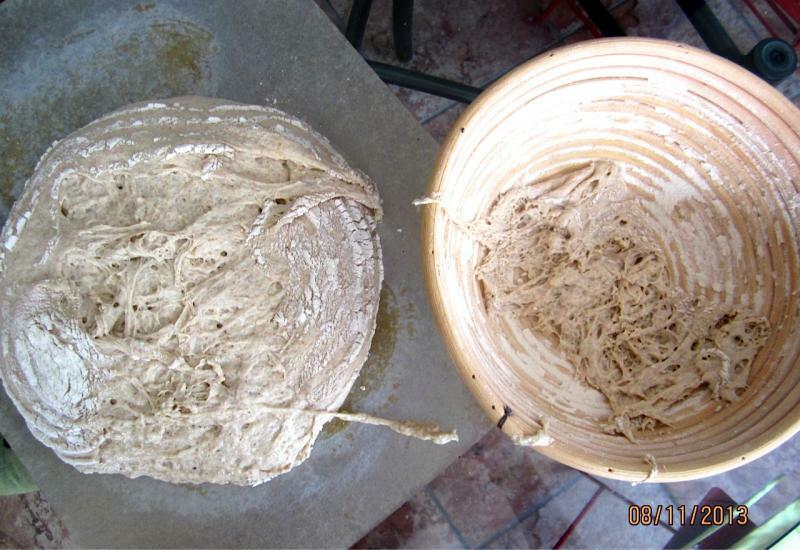 From Dan Lepard's Pumpkin Whey Bread I knew that very brief kneading (30 seconds), followed by some folds, can be sufficient to process some doughs - but pinching? This worked well for other DO breads I baked, like Aroma Bread. Therefore, save your skin - use parchment for a painless transfer. Combining both in a loaf à la Forkish, this is the bread I came up with: EINKORN HAZELNUT LEVAIN: Here you can find my formula and description to make this tasty bread - pinching instead of kneading! 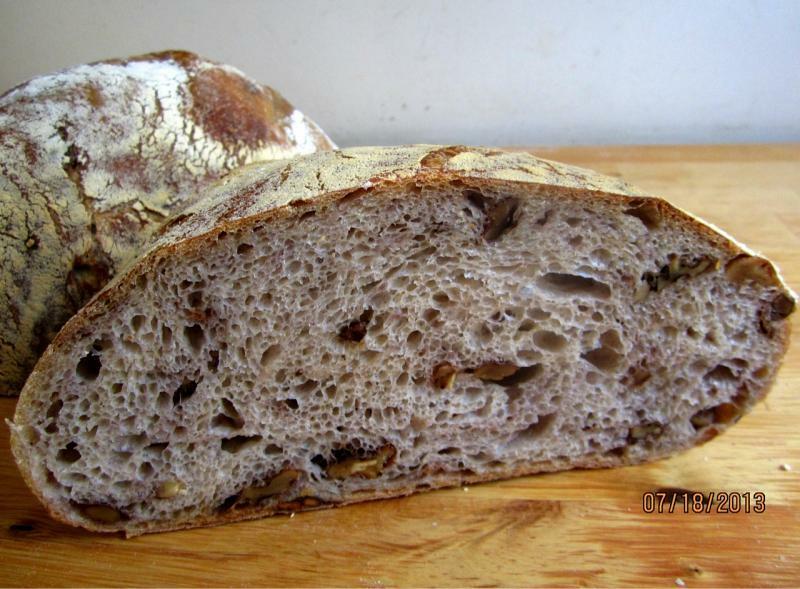 Einkorn Hazelnut Levain - pinched instead of kneaded! That looks beautiful, really truly beautiful. I have that book, it is my favourite bread book so far along with Emmanuel Hjiandreou's. I have not tried that recipe yet though. I did also have my only ever dough stuck to the banneton with one of Ken's recipes ( also rather unfortunately it also stuck to the Dutch oven!). But the bread is good. I think he says the pincer movement is to mimic the commercial dough mixer cutting through the dough. The waste in his starter method has been commented on quite a lot on various threads I think, and someone did say that somewhere he says you can keep half these amounts. It still feels like an enormous waste to me. My first loaf I just happily followed the recipe, building my levain, only to mix the final dough and go 'What?! You have had me build a kilner jar full of levain and now you want me to use just a tiny portion of it and call the rest 'spent fuel'!'. I am wiser now! I build what I need. Aside from the discard issues, I love the book. The pizza dough recipes are excellent too. Your bread is stunning as always and the crumb looks amazing. P.S am loving The Weekend Baker. My son says the one pot chocolate chip cookies are the best he has ever eaten! (And I have made him an awful lot of chocolate chip cookies!). A bread sticking to the DO - that happened to me when I made one of Farine's breads - it was very difficult to pry it loose - it broke and half remained int the pot. With parchment paper that fortunately can't happen. This bread is my own formula, inspired my Forkish's "Overnight Brownie" and "Walnut Levain", you find the recipe in my here in my Brot & Bread blog. Yes, the Weekend Baker is awesome, I'm glad you like it! Ah, a mix! I misunderstood and thought that you had just used hazelnuts instead of walnuts. It looks so tasty. Some of the photos on here just make you want to get into the kitchen and bake! Yours always do! Sounds interesting, Karin! Very attractive too. I can't source Einkorn here, but it looks like a fine combination with masterful hands. I still haven't bought Ken's book yet, and your post above adds to the motivation. I don't have any Dutch oven/casserole either, but i love your description of the bread texture. The very same happened to me with my latest spelt sourdough; it clinged to the brotform and i had to pry it out. However, i reshaped it and let it proof for a short while and baked it. The bread rose wonderfully, but i believe that this cannot apply to all dough types. Always enjoying your posts, Karin. You don't have to use Einkorn, take whole wheat or spelt instead. Try my formula (the link is in the post), then you can decide whether you want to buy the book. And you don't necessarily have to bake it in a pot, bake it like your regular breads. I was also wondering, whether I should reshape the broken bread, but in the end I just scraped the sticking dough from the basket and put it back on top. The bread looked ugly but still had some oven spring. Right now I wish you could send me some warmth - here it's freeeeezing! Those are some crazily beautiful looking breads. That's a very high bar you set for us all. I feel very inadequate ! This is my ninth bread, made with the pinching method. I am surprised you can buy Eikorn locally. I have to buy it off of Eric's site 'Breadtopia' so it is a bit pricey due to postage so I use it sparing. I can get Kamut locally so I end up using that more often. Loved hearing of your antics in the kitchen. I have had doughs stick too and I have even dropped a fully proofed loaf. Much to my surprise it still sprang in the oven. I know you bake using steam via hot water and a hot pan so I am curious to ask you what difference do you find in the final loaf when you bake it in a hot DO? Yes, I was very surprised to find the flour in the natural food store, too. And a bit later, I saw bags with the whole grain (from Roland) at Reny's (a store that sells reduced and bargain goods). I grabbed all I could find. In principle there is not much difference between baking with steam on a baking stone, and in the DO. Highly hydrated breads rise higher in the DO, because the can't spread. Crustwise, it's the same. 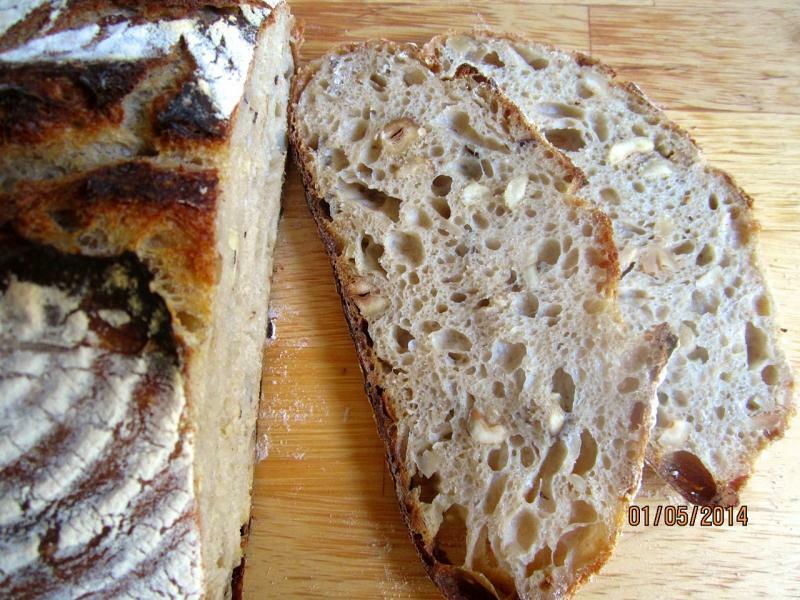 Beautiful crumb on the top and bottom loaves in this post Karin! All good wishes to you, too! Even the ugly duckling came out nice on the inside. I don't like the spent fuel notion and the waste involved with KF's breads since the part he throws away is exactly like the part he uses . But hey, it's his money and as a bread libertarian i couldn't care less - but I'm not doing it either and will make levain to order in the exact amount necessary. Love you baking as usual but nuts are not seeds and even though we baked a much worse ugly duckling today, with two nuts and no seeds, Lucy is not the Queen of Seeds even though she wants to be more than anything. Nothing a few hemp seeds won't fix next time. I bought some Einkorn berries the other day and, being unfamiliar with the grain, did a google image search to see if they might point me to a good formula. I have to say, a sorrier bunch of breads I've never seen until I came across yours! Your comments on Forkish's books are an added bonus. I've had the same reaction to all the wasted levain and I think it would be nice for him to venture outside the DO but I love his technique and have really enjoyed the breads I've tried. Have you tried his pizza-baking technique? I've been tweaking it a bit and am now baking pies in just 5 minutes and they look like they came out of a wood-fired oven. Fantastic! 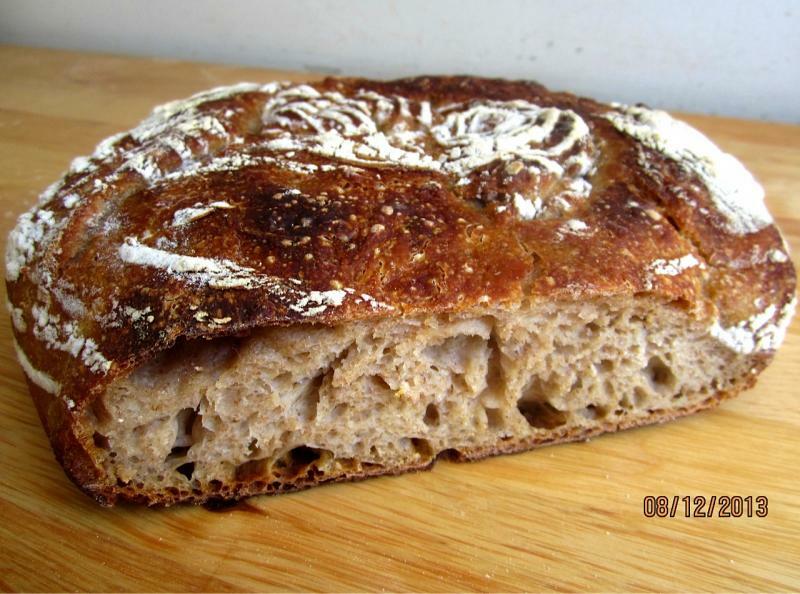 Do try the Einkorn Hazelnut Levain, I'm sure you will like it. Strange, that there are only such pityful breads out there. Though the flour is available in Germany for quite a while already (as several of others we don't get in the US), I found Einkorn here only a few months ago, imported from Italy. I haven't tried Forkish's pizza-baking technique, yet, and I would be very interested in learning how you tweaked it to make such satisfying pizza. 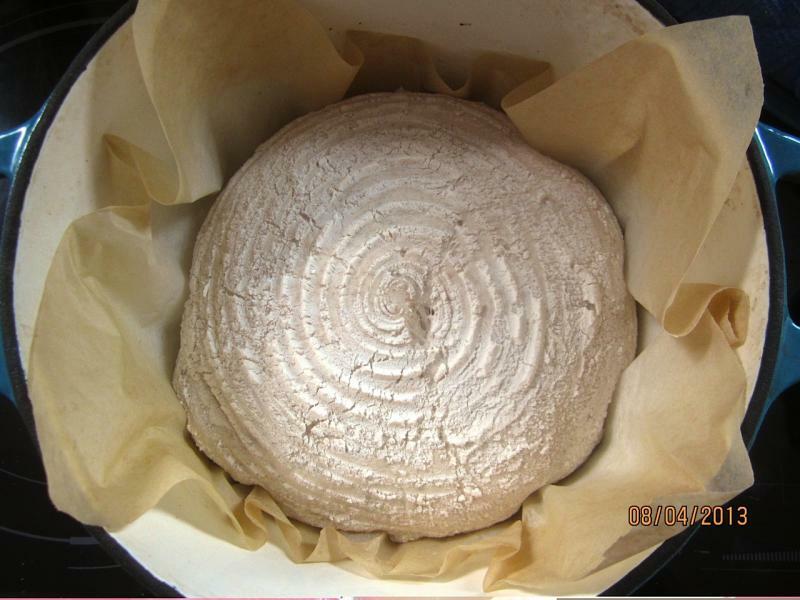 I have rising now a Einkorn/AP levain -- won't bake until tomorrow but I'll try to post a photo. I didn't follow your formula because I didn't have nuts. The only tweak to the pizza is that I bake for 3 minutes, then pull the pizza, switch the broiler on, and then add the cheese before loading it back in for two minutes. If you add cheese at the beginning it tends to "break." Next time I do pizza I might not bother with turning the broiler on partway -- the crust was already on it's way to getting a nice char. BTW, I've tried Jim Lahey's approach, which also utilizes the broiler, but it doesn't work nearly as well IMHO. -- Update: Today I baked up both a pain de campagne (using Forkish' formula) and the Einkorn To combat the stickiness of the dough, I put flour and a good amount of bran flakes in the bottom of the banneton before adding the loaf. It worked and I got a nice bran crust. I think the Einkorn has the better flavor of the two. I ground the berries somewhat coarse ( in my electric spice grinder) and the flavor is excellent -- fresh wheaty flavor offset by the tang of the sourdough. (The Einkorn is grown in Washington state which is where I live). Both breads were pretty darn tasty with the cultured Jersey cream butter I made this morning (isn't that a lovely yellow? ).